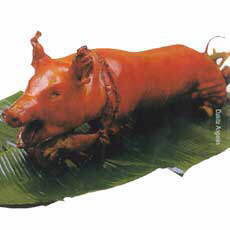 The lechon (whole roasted pig), is probably one of the most famous among the Philippine dish in the country. It is almost present in most, if not all, occasions. It is mostly seen during the christmas and new year season, birthdays, fiestas, and also on family gatherings like reunions. It is served with rice and liver sauce. The longanisa is more of an everyday food. It is usually served together with fried rice and egg. It is made of ground pork meat seasoned with pepper, salt, sugar, garlic and placed inside pig casings or intestines. For skinless longanisa, it is simply wrapped in wax paper. 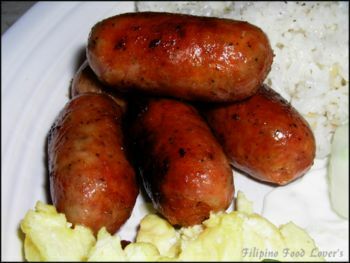 In some other regions in the Philippines, mostly Visayas and Mindanao, longanisa is more commonly known as chorizo. 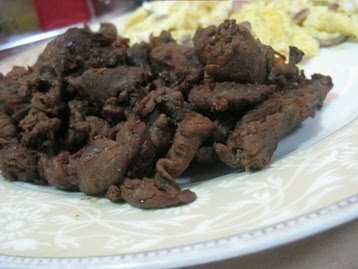 Just like longanisa, Beef tapa is also considered everyday food. It is mostly served at breakfast with fried or plain rice, fried egg, and achara(papaya strips on vinegar with sugar and pepper). It is thinly sliced beef cured in vinegar, salt, soy sauce, garlic, and pepper by combining all ingredients together and let it simmer while adding a little bit of water at a time until all the sauce evaporates, and then it is left to dry overnight in a refrigerator. It is best cooked fried.